I've been working like an absolute demon on this over the weekend. Given the quilt is a gift for a friend's wedding this month, there's no question this has to be my March goal. I'm really happy so far with how it's turning out, but it is starting to get a bit all-consuming and I'll be very glad when it's finished. Love the fabrics and colors. Is this your design or a purchased pattern?? Also, a very clever way to show the progression of your work. Good Job!! Thanks Judy! I saw the inside square pattern on the front on another quilt somewhere, but the rest I've been making up as I go along. I like the "collage" you made of the pictures rather than adding them one at a time. What a good idea! Thanks Mary. I've been posting progress on Instagram, so it was easy to go back and find them from the start. They're some of the bride's favourites Kathy – they are lovely, fresh colours. I am loving the color's, good luck in your finish. Thanks Mara. I've done myself a timetable with how much I have to do each day so I make it in time! Nerdy or what? 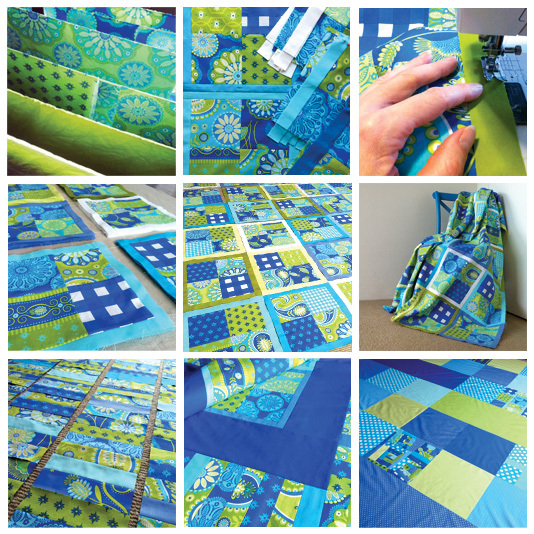 I love the striking colors in this quilt. I can't wait to see it finished. I will be nerdy with you... I totally make timetables too! Thanks Lacosta. I can't wait to see it finished either! Glad to hear I'm not the only one with a sewing schedule. There's just not enough hours in the day - very pretty color choice you have and I like that you're making it up as you go. My kind of approach.